Iranians head to the polls tomorrow to vote in their 10th post-revolution presidential election, and some observers are studying online behavior for clues on how to predict a contest that looks too close to call. In an article in Foreign Policy, Scott Hartley asks, "Who's winning Iran's Google war?" With more than one third of Iranians now online, search data offers unique insight into what voters might be thinking. Armed with English and Farsi results from Google Insights for Search, Hartley infers that challenger Mir-Hossein Mousavi's appeal is highest among urban elites in Tehran and Shiraz, while incumbent Mahmoud Ahmadinejad dominates the less-cosmopolitan cities of Qom, Karaj, and Mashhad. 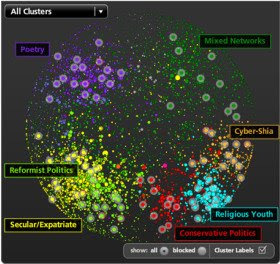 Hartley also points to a fascinating map of the Persian blogosphere developed by Harvard's Berkman Center for Internet & Society, which outlines the diversity of political viewpoints across 400,000 blogs. How will it ultimately play out? We'll have to wait and see. But as Internet penetration increases around the world, search data and other online behavior may continue to emerge as key research tools in future elections. It's been remarkable to watch the sparks of shifting media, new technologies, changing demographics, and other factors coalesce this week. This puts an interesting angle on it all. Iran is a pro-terrorist state - at least its government amounts to that - you can read more about the history of terrorism in that region and the world in general at www.coldwar.net - and the book Cold Warfare II: Political Terror. The USA did not always treat Iran right, but that is no excuse for executing people it considers politically and socially undesirable - or backing global terrorist groups - or for that matter striving to develop nuclear weapons. During the Cold War Reagan said he imagined a world free of nuclear weapons - the number of US nuclear weapons has dropped considerably - Iran is wrong to try and build more, the world does not need them any more than it needs a hole in the head. While internet search data may prove a useful research tool in future elections, one can only hope that it will be wielded with more skill than is displayed in the conclusions drawn above. The writer's inferences are largely based on the unsupported assumption that google searches imply political support. The breaking news provided by the Berkman Center's map of the "Persian" blogosphere is that there are a diversity of opinions on Iranian blogs - an astonishing finding only because "conventional Western wisdom... had assumed that the Iranian Blogosphere was dominated by secular, reform-oriented bloggers opposed to the governing regime." Though failing to offer any nuanced political analysis, this article and the press surrounding it do provide a classic case study in the cutting edge field of cyber-Orientalism. Interesting. I just discovered this side of google. There are always so many surprises. @ppacalo Iran is not a pro-terrorist country and we have never seen or heard an Iranian in a terrorist group. Iran is also not trying to build nuclear weapons as far as IAEA says. please don't propaganda and don't propagate your hate speech. Solve your issues somewhere else, If you are angry for 9/11 look at saudi arabia/ afghanistan/ pakistan and other countries that terrorists where from them.